(NEW ALBANY, Ind. )—The Samoan tattoo runs in a band around the lower leg of Anne Allen, professor of fine arts at IU Southeast, with two outer rings bearing stylized ocean waves bounding a decorative center, a tala or mat design. The design was created for Allen by Croc, a student of Inia Taylor, who is in turn a student of the master tattoo artist Paulo Suluape, using a traditional technique involving boar or shark tooth, cut shells and ink made from the soot of a candlenut fire. Allen’s tattoo took nearly three hours to execute. Time for reflection, conversation and periodic gritting of teeth. That was 2010, in Rarotonga in the Cook Islands, in the South Pacific. The occasion might not have had the ceremonial pageantry of a traditional malu (women’s full body tattoo), but it had a logic. Allen was in Rarotonga attending a scholarly conference, and was surrounded by guides, mentors and colleagues. It was the right time, after decades of immersion in Pacific cultures, and an equally long period of clarifying her own identity in relation to it. It was also the perfect illustration of the interweaving of personal journey and academic mission that marks Allen’s career and her approach to teaching. It’s a long way from the vanilla jungle of Southern California’s San Fernando Valley to the village of Fagamalo, Samoa. 4,824 miles to be exact. And even further, if you’re speaking culturally, as Allen always is. In that sense, the two places are universes apart. Allen came of age in Reseda, a blindingly white suburb of sprawling Los Angeles. Two decades later, she found her spiritual home in the tiny (pop. 380) village on the northeast coast of the island of Savai’i, as a doctoral student in art history. That Allen made the leap was itself the result of a series of transformations, driven by an inner yearning for something different, something beyond. Imbibing the voyages of Jacques Cousteau as a child, she originally set course for a career in biology, researching the mysterious and captivating behavior of sharks. But a course in Pacific cultural traditions at the University of California San Diego with the revered authority, Jehanne Teilhet-Fisk, planted a seed of a different nature. Over the next several years, with marriage and motherhood and relocations and a certain amount of reflection—“I took some time off, did some random things”—her interest in biology as a career waned. Something on the ocean wind was calling. A trip to the Pacific rekindled her interest in native culture, and she soon found herself in Samoa on a Fulbright fellowship. Within a very few years, she became an authority on Samoan architecture, both its structure and the ways it expressed elements of Samoan identity, mentality and power. Along the way, she became adopted by the family of the village chief, accepted for her knowledge, respect and material contributions to village life. That is only one of many journeys undertaken by Allen in a lifelong expansion of enlightenment. To a great extent, it’s impossible to examine her teaching philosophy without understanding her own metamorphosis, because her classes are re-enactments of that process–not in a schematic copycat fashion (and certainly sans tattoo! ), but in the way some of the same doors are opened, to show students what lies beyond. By immersing herself in Samoan culture, while still holding on to her American roots, she arrived at an awareness of what humans share across cultures. And this consciousness is what she seeks to bring within her students’ reach. Allen joined the IU Southeast faculty as the institution’s first art historian in 1994. Her focus was, and remains, indigenous art traditions of the Pacific. An expert in the field, she is editor of Pacific Arts, the journal of the Pacific Arts Association, which she has also served as a member of the international board. But her teaching is not limited to that area, encompassing Native American, Northern European, Pre-Columbian, Baroque, and Japanese art, among others. Her excellence in the classroom has won her five Trustees Teaching Awards and an IU southeast Distinguished Teaching Award (2005). Allen’s overarching concept of instruction is at once simple, and universal. For Allen, to be a citizen is to overcome the limitations of inherited or imposed mental constructs that divide the human family into artificial groups such as tribes, nations, races. Philosophically it is to overcome the ignorance that begets fear, and the fear that begets hatred. The goal is respect for and empathy with other human beings and their cultures. Art history is not generally seen as the school of civics. Yet in Allen’s hands, it becomes a sort of rosetta stone. In her art history classes, students are constantly challenged to compare differing societal norms, creative styles, artistic traditions. Exposure to “the other”—actually, to a whole lot of “others”—can be electric, difficult, ecstatic, troubling, and much more. “They’re learning about the human condition, what it means to be human, and part of that is not always understanding, but accepting that there are differences, and in that fact, there are commonalities,’ Allen said. Case in point: the Aztecs. It’s hard to find a people more at odds with contemporary American sensibilities. It would be wrong to conclude that Allen overdoes the anthropological, or doesn’t care if a student comes out of her class without knowing the difference between Donatello and Bernini. But what matters more to her is that students learn to think critically about the art they are seeing. “The art is just an excuse,” Allen said, only half-joking. She wants students to get behind the formal aspect of art, to deeper motivations of creativity, to the WHY of art. “My objective in every class is to help students think critically about information, and leave with a comprehension that carries over into their lives,” Allen said. That carryover is what makes material personally relevant. In her own work and experience, the architecture of Samoan villages was intriguing, but the really fascinating thing was what that architecture said about the people and their sense of their place in the cosmos. One of Allen’s most defining innovations is also one of the most deceptively simple: she asks students to define their world view. In a few words. Not to provide an –ism or a link, but to pare their most fundamental belief system down to its most essential and unifying precept. It proves very hard to do. “Many struggle with articulating a world view, others have never been required to consider what they believe or value,” Allen said. Once the world views have been clearly articulated, Allen pours them into a crucible of cultures via artistic expression. We’re back to the why. Encountering the world on its own terms: Allen (l) works on a mat with her sister Elina, in Samoa. Photo courtesy of Anne Allen. The point of the exercise isn’t instant enlightenment through a shattering of all that is held dear, but the cultivation of a certain habit of encountering the world on its own terms. Just as they have become conscious of their own world view as a lens through which they see and interpret the world, they come to view art as a language–or myriad languages—articulating viewpoints every bit as logical, on their own terms, as their own. In that act of comparison, without blinders or judgment, Allen sees students grow as people, and as citizens. It’s a process she knows well. Raised an environment with so little cultural diversity that overt racial bias was superfluous, Allen yearned for the seemingly more vivid tones and textures of different cultural traditions. New York City, Samoa—the stations on her journey drew her out of herself, and at the same time provided a sort of sound board on which her Americanness could resonate with more clarity and nuance. From knowing oneself in this way comes the assurance and courage to open up, and be willing to understand and accept the essence of another person, another world. That other world may be Washington, D.C. or New York City, where she has taken students on study trips in the past. Or it may be to her own personal other world, in Samoa, where she brings students for an entire month of study abroad each summer. This is not Club Med. And Allen is no tour guide. It is a true immersion, an encounter with “the other” that cannot be achieved in the classroom, no matter how aggressively you flip it. 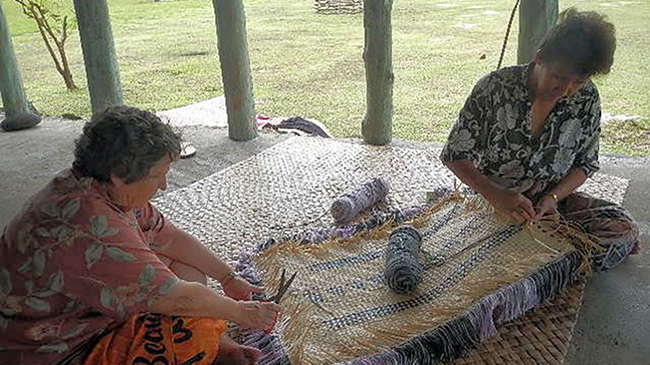 In the village of Sala’ilua, students stay with the barkcloth maker, Makulata Faatoafe. In Fagamalo, they live with Allen’s “brother” Enoka, one of the chiefs (Matai), and learn basketweaving from his wife Fauga while another of Anne’s “sisters,” Elina Fa’so’o, teaches mat making. The students would not be able to get this kind of access to Samoan life and culture in any other study program. They learn about Samoan art in a very traditional way, as apprentices of the craft. And they learn how the art and architecture function to express and reinforce village identity, not through reading about it, but through living in it. This is the flipped classroom taken to its logical conclusion. “You slow down, decompress, put up with boredom, read, paint on bark cloth, help in the house, play with the kids—you go back to some of the older ways we used to interact,” Allen said. At the end of the month, there is a departure ceremony for Allen and the students. Allen knows the trip has been a success when she sees the students dancing by the firelight, singing with their Samoan hosts, and shedding an ocean of tears. Allen notes that Kentuckiana can be comforting, some might say insular. Yet it is changing, beginning to reflect a more interconnected world. For Allen, that means teaching must include opening students’ minds to the widest range of human experience. She has walked that talk. And returned to literally tell the tale. The result, she knows, is a deeper and more empowered relationship with home. In mining her own outsize experiences for the benefit of the classroom and encouraging students to explore their own thought-worlds, in trusting students’ instincts and challenging them to define their place society and culture, Allen may ultimately exemplify something quite apart from the teacher in the classical Western sense, or even in the Samoan and Navajo sense. Her approach may come closer to the role of the storyteller in Eskimo culture. 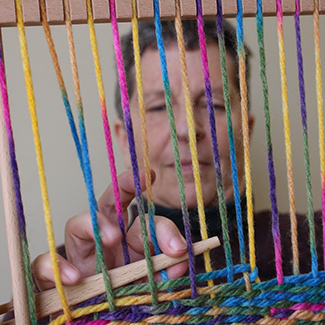 Homepage photo: Dr. Anne Allen weaves on a Navajo loom.